Double Cylinder Deadbolts are unlocked with a key on both sides of the deadbolt. Most exterior doors use a combination of one deadbolt, and a keyed lever handle or door knob. We can key your door locks alike as long as the deadbolts are the same brand as your door knobs or lever handles. Available in Satin Nickel and Oil Rubbed Bronze. 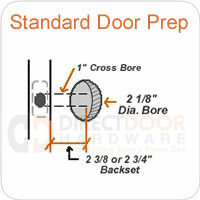 - Fits doors prepped with 2 1/8" bore hole and 1" cross bore. - Heavy duty security strike with 3" screws. 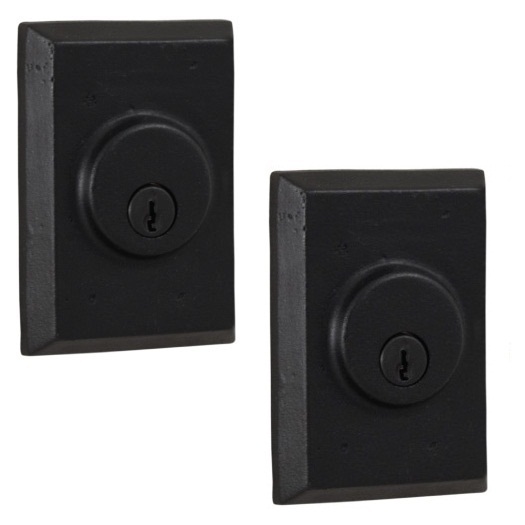 - 1" throw deadbolt with two hardened steel rollers -- prevents sawing. - Adjustable Latches with removable faceplates -- 2 3/8" or 2 3/4"
- Heat treated assembly housing screws. - Exceeds ANSI A 156.2 Grade II lock standards. - Two halves of the deadbolt - One keyed cylinder for the outside, one keyed cylinder for the inside. - Mounting screws, Mortise and Strike Plates.